Love Bites bonus DLC: Introducing Ashley! Surprise, surprise! I’m proud to announce that we’re working on a bonus DLC for the game “Love Bites”. And the best news is that the DLC will be included for free in the base game! 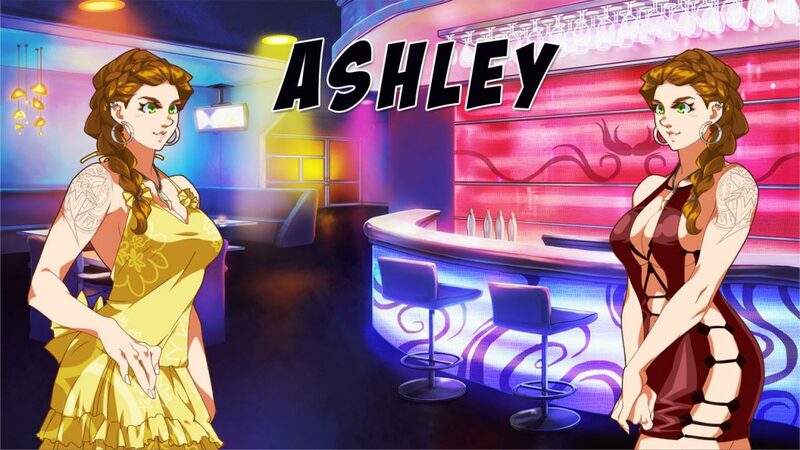 The DLC will add Ashley to the pool of the romanceable characters. Since both the writer and I loved her (for the appearance and personality as you’ll read below) we decided that would have been a pity to not add her. Like the other love interests, she’ll be available both to Kaitlyn and Brandon. Now I can of course imagine that some people will be disappointed that there’s only one extra female, but also for technical reasons (like there simply wasn’t enough space to add more characters in the scheduler! and other things) we can only add one more, and after some recent events (cancellation of Nicole yuri, long time since I made a BxG game) I think if I had to add one character only, it should have been a female. However, we might explore Love Bites world again in future, maybe in another game, and we’ll make sure to include some handsome boys too. Everything depends also on Rebecca’s (the artist) availability since she’s very busy. The DLC writing has been already finished, but it still needs to be scripted and tested. I hope to have it ready next month. Ashley is a soft-spoken, gentle woman who is much tougher than she looks. She has a deep abiding love for nature, and animals in particular. As such, Ashley is pursuing a graduate degree in environmental studies, and hopes to get a job as a botanist afterwards. However, school is far from cheap, and to curb some of the soaring costs, Ashley works as an exotic dancer. The job is a means to an end, but her family is less accepting. This bothers the normally upbeat Ashley more than she likes to let on. In such instances, Ashley takes solace in the nearby woods, spending entire weekends communing with nature alone. An avid outdoorswoman, Ashley knows the best parts to go camping, the best place to pick flowers, or the tastiest patch for berry picking. In the great outdoors she feels truly at peace…which should come as no surprise as she is also a werewolf. Unlike movie lore, most werewolves are not cursed, but born that way. While her bestial side didn’t come as a surprise since her older siblings are also werewolves, Ashley has a hard time reconciling her animal nature with her human side. Unfortunately, many people can sense when there is a predator in their midst, no matter how well-hidden, and this means Ashley has found it hard to make any close friends, let alone lovers. Those who aren’t put off by her, find they have a friend for life. This isn’t to say Ashley hates her wolf nature, far from it, but she is learning that sometimes she has to let the wolf loose…or else, it will do so of its own accord, especially when the moon grows full. In those instances, Ashley will usually head for the woods. While more than capable of defending herself, she’s also learned she isn’t the only person with a secret to hide. During one incident in which a drunken, belligerent patron decided he could take advantage of a fellow dancer, Ashley intervened…and nearly lost her arm in the process to a young woman with black and purple hair. The woman said she wouldn’t allow Ashley to hunt among her charges. Things might have escalated, except the dancer came to Ashley’s aid, pointing out how wrong the raven-haired woman was. Embarrassed, the young woman fled, but from that day forward, Ashley kept a closer eye on her friends and coworkers. This entry was posted in dating sims, general, love bites. Bookmark the permalink. 4 Responses to Love Bites bonus DLC: Introducing Ashley! Hi will you be able to get Ashley on Android version? Yes, but I’ll need some time before it’s out on desktop! I had a similar question, is Ashley available in the iOS version?